Badda Bing’s owner Rick Belcastro is proud of his gentlemen’s club, which looks like a Moroccan palace. The red velvet draperies, carpeting, sofas and intimate rooms are outstanding. Rick is from the old school where he believes everyone should be treated like family and he makes everyone feel at home. That is one of the reasons he received the 5 Diamond Award for excellence from SDE. Publicist Bobbie Katz invited the media to celebrate Monti Rock’s 70th birthday and to officiate the wedding of Yakup and Pamela Kale. Many of Monti’s friends came by to help him celebrate. It was a great event and we stayed long after the media party was over. Jennifer Harman and Phil Hellmuth, Jr. 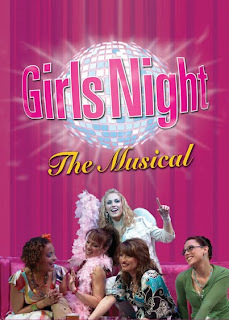 The inaugural event took place Wednesday, May 19, 2010 in The Grand at the Golden Nugget Hotel in Las Vegas. Eight teams from Australia, Brazil, China, England, Greece, Israel, Vietnam and USA were there to compete for the $400,000 prize. 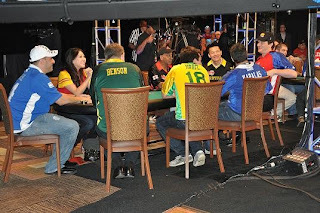 Five tables were set up and the last two players from each table would go to the final table. USA team captain Doyle Brunson, with 10 WSOP bracelets, coached his legendary team. Israel had Eli Elezra as its captain who is a regular on the game show “High Stakes Poker”. On his team were David Levi, Robert Mizrachi, Michael Mizrachi and Abe Mosseri. They all were a strong and powerful team. 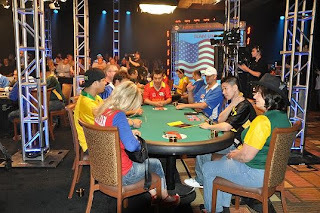 Brazil had a young lively team also, which brought them all to the final table. Captain Juliano Maesano led his enthusiastic team, Christian Krukel, Leandro “Brasa” Pimentel, Rodrigo “Zidane” Caprioli and Felipe “Mojave” Ramos and encouraged every winning play with his strumming on an instrument. Australia Co-captains Jeffrey Lisandro and Tony G calmly interacted with his team, Billy Argyros, Gary Benson, Mel Judah, Grant Levy, David Saab, Steve Topakas and Marsha Waggoner who is the “Grand Dame of Poker”. 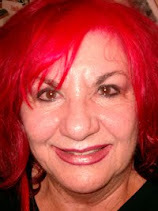 Waggoner, with 33 years of poker experience became the first woman to be inducted into the 2010 Australian Poker Hall of Fame. Vietnam had Men “The Master” Nguyen as their captain. He holds six WSOP bracelets and has won over 9 million dollars in tournament winnings. Scotty Nguyen, Van Nguyen, Karina Jett, Kenny Tran and John “The Razor” Phan were focused and an outstanding team. England captain Ben Roberts had a dedicated team of players. James Akenhead, Joe Beevers, David Colclough, Peter Costa, Surinder Sunar, Dave “Devilfish” Ulliot and Ram Vaswani. 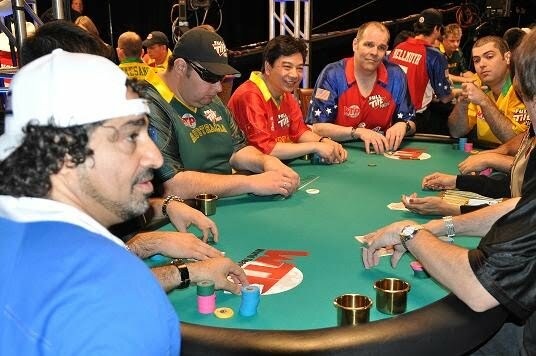 After 12 hours of playing, five teams won their places at the final table. Congratulations to China who, after 20 hours of playing, won the $300,000 prize and to Brazil who came in second place and won $100,000. 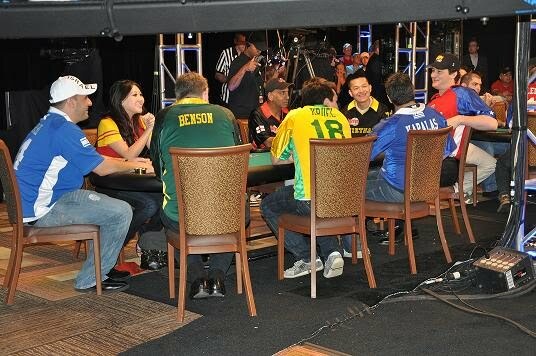 We all look forward to the next World Team Poker this summer which will have 31 countries competing for the title. A thank you goes out to the commentators, Kenna James and Matt Corboy, who did a great job. On May 13, 2010 a new show, Girls Night the Musical, opened at the MGM Grand Hotel. After touring the country and performing in off Broadway shows, it is now opening in Studio 54 in Las Vegas. There were times that the girls were raunchy and boisterous and it did fit the characters they were playing. It was a night out at a karaoke bar and Anita brought down the house with her powerful, soulful voice. There were a handful of men in the audience and they seemed to be enjoying themselves. It was fun watching the characters and seeing who we mostly could identify with. All in all, it was a lot of laughs. And visions of sugar plums danced in their heads; oops……….I meant Popcorn, barrels full of gourmet popcorn. Popcorn Girl has over 52 flavors from Chocolate to Toffee Almond, Cotton Candy, Strawberry, Sour Cream, Mac & Cheese,Hot Wings and every other flavor you can imagine. Laurie Sabol can be described as a sweet, lively and friendly young lady who is known as the Popcorn Girl. Laurie lights up the store with her energy and great smile as she greets everyone coming into the store. Mark Smith is her business partner in this venture that they started last November. While Laurie is up front working and greeting the customers, Mark is busy in the back of the store quietly preparing all the delicious colorful popcorn and the aroma of fresh popped corn is heavenly. Mark has it down to a science as he carefully mixes each special batch of his secret ingredients in his clean and immaculate kitchen. He cleans every utensil and pot as he goes along. Every lady would love to have a man like that in their kitchen. Mark can be found in the kitchen everyday, all day long, making the special gourmet popcorn. It also takes a lot of strength to mix and cool the popcorn as soon as it is poured onto the mixing table. Customers are able to sample the popcorn and the candy fudge so they can decide what to buy for that day. My precious moment picture of the day was when Kate, Rock and Jack Peterson were standing at the door looking in and were patiently waiting for their father Ryan to come and bring them into the store. I could see the excitement in their eyes as they looked at the store full of goodies. Jack said that he comes to Popcorn Girl every Saturday to buy popcorn for his family and they love it. Everyone is calling Perry Danos the New Voice in Town but I am calling him the New Greek in Town. Being a Greek myself, I am partial to anyone who I meet that is Greek. It is something in our heritage that brings an instant bond and admiration when we meet each other. Such was the case when I met Perry Danos at his show. His handsome looks, charm and kindness touched my heart as I am sure touches everyone who meets him. The best part is that he has the talent to go along with all his other attributes. He has a beautiful soothing voice, both singing and speaking. Perry Danos hails from Chicago and is presently living in Nashville, but he has a strong desire to move here to Las Vegas and we would love to have him here. He loves it here and says it is a perfect place to play. Perry is passionate about his music and he puts his heart and soul into each song. As a young boy, Perry started playing the drums and guitar and then started singing, which became his passion. He writes his own songs and is recording a new Christmas Album. Perry commands and takes charge of the stage the entire time with his energy and his quiet charm as he talks to the audience and involves them in the show. His eight piece band and four violinists add much to the show along with Will Barrow, his musical director, who plays the piano. There is lots of energy from the very talented backup singers who add a lot to the show. Perry is proud of his son Connor who plays the drums and guitar and his daughter Thea who also sings. The talent runs in the family and that is something to be proud of. Afterwards several friends stopped backstage to congratulate Perry on his great show. I too enjoyed spending time with Perry and I look forward to his return to Las Vegas.